The first Old Firm game of the season came and went with its usual fanfare, hype and controversy. Hundreds of thousands of words and column inches are devoted to the build-up of this unique fixture – hundreds of thousands more to poring over the smouldering remains of the latest ‘explosive’ clash. Touchline spats make the headlines. On and off-field fireworks and histrionics are feverishly discussed as disapproving voices delight. It’s car crash viewing at its very best. This was supposed to be the biggest test yet to Celtic’s domestic dominance. Could Rangers halt the juggernaut at 56 unbeaten matches? Amidst the mayhem, a much more subtle and nuanced battle plays out. Scottish football ‘fanalytics’ is a growing movement – one in which the writers I admire are too many to mention. Celtic’s quick and effective transitions after drawing a Rangers press. Rangers’ poor decision making on the counter attack. The Invincibles’ achilles heel – areas for Rangers (and others) to target. Caixinha’s conundrum and Gers’ confusion – when to press and when to sit back. As the ball is contested in midfield, Rangers’ positioning is suspect and Tom Rogic fires an early warning shot. In the screenshot above, Ryan Jack is looking at Rogic in space. He can see the danger. But as Armstrong shakes Dorrans off, Jack’s body shape is wrong as he turns his back on Rogic and is attracted to Armstrong progressing with the ball. This is a direct result of poor positioning from Peña and Windass. Ideally they would be goal-side. At the very least they should be much closer to Rogic and Roberts respectively, allowing Jack to drop off and provide protection in front of the defence. As Rogic receives the ball, Windass has been drawn into the centre and has completely lost Roberts who pulls into acres of space on the right. Rogic takes the wrong option with the shot, but Rangers had been warned. Celtic’s tactics became clear as the match settled. Here, Celtic’s defensive line is a back three of Boyata, Simunovic and Lustig. Tierney’s starting position wide on the left is so high that he is effectively an extra midfielder as Celtic build. From a double midfield pivot, either Scott Brown or Stuart Armstrong is always available to offer a passing option. There’s no rush from Celtic. Five passes are exchanged between the back three as they dictate the tempo. When Morelos, Peña and Windass are eventually drawn to the ball to pressure the Celtic defence, the Hoops’ transition springs into effect. Within three passes Rogic is in the Rangers box. Brendan Rodgers’ men are so well drilled in their system that they know exactly when to invite pressure and when to spring out around the press. Kieran Tierney received the ball in space on the left, here, and finds Stuart Armstrong between Rangers lines. Carlos Peña is already struggling to keep up with play, as Rangers are set up 4-2-3-1. It was far too easy for Celtic to play a vertical pass through the lines, completely bypassing the Rangers midfield. What happens is that Fabio Cardoso is forced to come out to the ball and there is space left behind him. Rogic and Roberts on the right, meanwhile, are open in tons of space again. In the previous scenario, it took nine passes between Celtic’s defence and Scott Brown to draw the Rangers press. From there, two passes – Boyata to Tierney then Tierney to Armstrong, and Celtic were attacking Rangers’ box again. The pattern was clear. Patient Celtic possession designed to draw the Rangers press, then quick, sharp and effective transitions into attack, leaving the Rangers midfield in disarray. This time Celtic showed some variation on the same theme. From a throw-in on the halfway line, Celtic reset their possession. Brown goes back to Boyata and eight passes between defence and deep-lying midfielders draw Rangers on. When Rangers press, Celtic strike. Lustig now looks for the forward pass to Rogic, who in turn finds Armstrong. Tierney shows the variation by going on the underlap this time, giving Rangers yet another new problem. 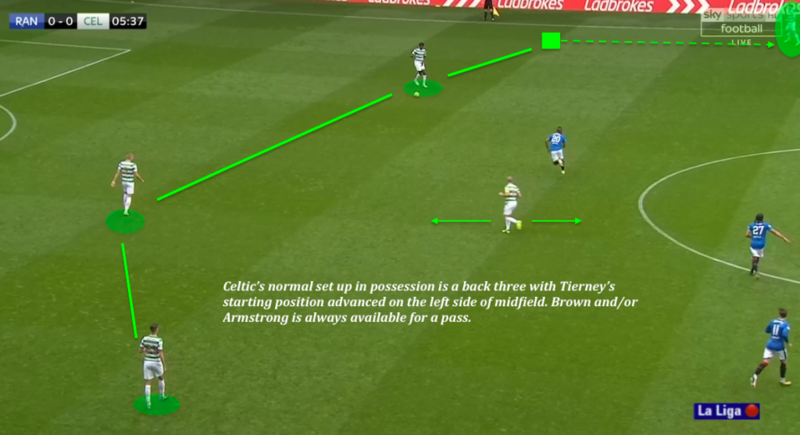 Armstrong is able to play the pass between lines and Tierney shoots, despite having at least three better passing options. Celtic’s passing ratio is clearly in effect again. Eight passes at the back. Rangers’ press triggered. Three forward passes between lines and Celtic are in a dangerous area. Decent from Celtic, but from Rangers’ point of view, this is embarrassing. Take another look at the image above. Rangers’ midfield is in total disarray. Dorrans and Jack are supposed to be a defensive screen. They should be deeper, facing up Armstrong and Rogic. Candeias’ head is almost literally spinning. He thinks he’s passing Tierney on to Tavernier as Candeias himself goes out to cover Sinclair. But where is he actually going? He’s five yards too late to have any effect on Sinclair. That leaves Tavernier marking two men and not knowing which way to turn. Peña is once again a mile behind the play, and even Windass, who is the least worst on this occasion, could still have tucked in to cover the space that Rogic is running into. Instead, there are four, FOUR, Celtic players running unmarked into dangerous areas. Rangers did eventually get to grips with Celtic’s system and dealt with it better as the match wore on, but there were far too many instances of this in the first half. In the image below, Rangers’ shape is a lot better with a 3 v 2 situation in their favour around the ball. But Windass is again five yards on the wrong side of Rogic. Meanwhile, Jack is rash diving in on Sinclair and Rogic has space to pick a pass to Roberts. When Rangers did achieve a better press it was effective in forcing Celtic to go long. In the next image, Peña and Dorrans both converge on Armstrong. Note Peña’s deeper starting position that allows him to join Dorrans in the press. Candeias is in position to block a pass to Tierney, or to close down Boyata if the ball goes that way. Windass too, can see the play in front of him and can react and decide whether to close down Lustig or Brown. Lustig has to go for a long ball – much less dangerous to Rangers than Celtic’s patient build up and sharp transition we previously saw (Typically, on this occasion a poor defensive header from Lee Hodson allowed Griffiths a shot at goal, but the point still stands). With this better pressing as the platform, Rangers were able to gain a foothold in the match, albeit that they still relied heavily on counter-attacks. Rangers lacked composure in possession though. This is why, despite several promising situations, the Gers were unable to convert these into presentable chances, far fewer goals. On numerous occasions, Rangers players made poor decisions and chances were lost. This, from a Hodson free kick, is far too predictable. The Rangers left back launches a hopeful ball up to Morelos, who is outnumbered two to one, and has no support anyway. Three more Celtic players are closer than any supporting Rangers player. This allows Celtic to win the turnover. One piece of excellent skill from Brown and one pass later, and Patrick Roberts is running at the Rangers defence with Hodson out of position. Next up Josh Windass has to either play an early ball or head to the bye-line. Either way, he would be crossing into the box to a 2 v 2 situation with both Morelos and Peña having the run on their defender. I can see why Windass didn’t play the early ball – the Rangers attackers were not quite advanced enough. However, instead of driving down the outside to improve the crossing percentage, he cuts back inside. Rangers paid for not having a naturally left-sided player on the pitch here. That couldn’t be helped due to injuries to Lee Wallace and Declan John. Had either played, they would have been bombing beyond Windass on the overlap. Lee Hodson, who did play, was too slow getting up in support. By the time he did, Windass has come infield and although he did fashion a one-two with his teammate, look at Celtic’s defensive shape now. Their defensive line is solid, with the midfield shield of Brown and Armstrong back in place too. Rangers’ laboured build-up and lack of width allowed this and the chance was gone. When Rangers were quicker in the build-up, like when Peña got in between lines here, Morelos too often found himself offside. In this example, Morelos has to begin his run on Boyata’s shoulder. He would still be goal-side and would back himself to win a race from that position. The frequent offsides from Morelos were poor. He’ll get away with it against 90% of the other teams in Scotland as they’ll sit deeper and he’ll continue to score goals. However, he must improve his positional awareness to thrive against a high defensive line, like Celtic’s. There are plenty of good reasons why Kieran Tierney, last season’s PFA Scotland Young Player of the Year, receives effusive praise as his market value soars. However, his buccaneering style, and the way Celtic’s system (changing to a 3-man-defence) accommodates him, inevitably leaves space when he does go marauding forward. Rangers, to their credit, noticed that and tried to exploit it where they could. After good defensive work by Candeias on Tierney, Carlos Peña picks the ball up and releases Candeias, who combines with James Tavernier down the right flank. This was a decent chance for Rangers and Tavernier played a cross into a dangerous area. In the next example, Tierney isn’t actually in a bad position. But by playing to their strengths and Celtic’s (qualified) weakness, Rangers created another dangerous chance. Windass and Hodson both made themselves available on the overlap on the left this time. But having seen them slowing play up by cutting inside previously, Jack recycles and passes infield to Dorrans to switch the play out to Rangers’ right. This is no accident as Tierney’s defensive position is Celtic’s main weakness due to him not normally being there! I think Rangers made this a target. Not enough, certainly, but it was a tactic, and can be copied by other teams. Morelos is inches away from connecting with Tavernier’s early cross, but if I’m being hyper-critical again (I am), Candeias should have taken Tierney away into the corner and created a 2 v 1 with Tavernier. As well as the overlap, this would have opened space for Tavernier to drive on himself. But Candeias’ movement was poor and the early cross was Tavernier’s only option. This continued the theme of Rangers’ poor decision making in attacking situations. After Morelos’ problems staying onside, on the one occasion he did, he had absolutely no support. The result is that by the time Dorrans arrived, Celtic were again back in shape and defending comfortably. Dorrans should have played Morelos back in, but with Celtic set and facing up, he attempts an extremely low xG shot from outside the box, and with plenty of Celtic blockers in the way. From another counter-attack, Candeias plays an early ball that comes to nothing. Like Peña before, Candeias should be driving forward with the ball and bringing his three teammates with him to give Rangers numbers in attack. Instead, he fires a low percentage pass at Morelos and it’s easy for Simunovic to cut out. Another Rangers counter coming up, and another poor decision from Tavernier. As a result, Kieran Tierney can do his defensive duty this time. There were plenty of other examples of Rangers either being too slow and laboured, or too direct with their offensive play, but you get the picture. The good news for Rangers fans is that this is infinitely coachable. If Pedro Caixinha hasn’t had the players on the Auchenhowie training pitches working on transitions this week then he really isn’t doing his job. Better decision-making in transition can be coached by simulating attacking overloads. If players are shown how to create numerical advantages and make them pay, they are more likely to choose the better option more often during matches. Rangers had a dilemma of when to press and when to sit back. I’ve demonstrated how a poorly coordinated, reactive high press can play right into Celtic’s hands. But on the other hand, sit off them at your peril. So what was Caixinha’s solution? Celtic have reset in their normal way from the back. But this time, there is no high press from Rangers. Even Morelos is back inside his own half. This means that the up-back-through transition from Celtic is negated. Instead, Rangers are quite happy to let Dedryck Boyata advance in possession – far better him than Brown or Armstrong. As Boyata advances, Rangers’ midfield and defensive lines are much more compact. In the image above, there are seven Rangers players in the zone between the dashed lines (McCrorie and Hodson out of shot make nine). What a difference to the previous disarray. The blue shirts are all in far better positions to go man-for-man if necessary. Even Josh Windass has tucked in better, and at least has a chance of getting to Rogic from here. Morelos, Peña and Candeias are also spare to provide zonal coverage. Boyata plays a pass into Sinclair, tight to the touchline with Tavernier closing, so Sinclair has to go straight back to Boyata who, lacking options, played the ball straight out of play. It was the kind of forced error that Rangers must aim for more of, especially against a possession-orientated side like Celtic. Exactly the same set-up, executed poorly, gave Celtic another excellent chance. Nine Rangers players are in the zone, with the defence and midfield compact and set. But individual errors are costing Rangers, and this must be worrying for the coaching staff. Meticulous planning counts for nothing if the players fail to execute. In the image above, the shape is not bad. Dorrans has been caught upfield, but Peña has covered in for him. Windass has been caught on the wrong side of Rogic for the umpteenth time, but the situation should be under control from Rangers here. However, as play develops there are so many basic errors from Rangers that Stuart Armstrong ends up in a one-on-one with Wes Foderingham. Fortunately for Rangers, Armstrong stumbled and Foderingham gathered. But how was he allowed to get into that position? Look again at Peña, closest to Boyata. He moves to press the ball but sells himself with a nothing challenge, and Boyata waltzed past him far too easily. Boyata then plays a simple wall-pass off Rogic. The Australian is able to play the ball first time as Dorrans is out of position and Windass hasn’t covered round. This is bad, but there’s even worse to come. Look at Armstrong’s starting position. He makes a good, but hardly unusual run. Two Rangers players are guilty of ball-watching though. Both Jack and Cardoso start in good positions to track Armstrong’s run, but both inexplicably move towards the ball and leave Armstrong all the space in the world to run into the box unchallenged. Again, take nothing away from Celtic, we all know they are capable of excellent, incisive passing to carve teams open. But, they didn’t need any of that here. This is a basic wall-pass. Forgive me for labouring the point – but a wall-pass! Remember, the kind that you were coached as a nine-year-old. Rangers showed all the sophistication of an under 10’s defence here, and the wall-pass was once again king. Shocking. When the teams emerged for the second half, it looked from the off, as if Rangers had decided on the high press. The difference from the first half was that this was a conscious decision from Caixiha’s instruction; not reactive, falling for the trap set by Celtic to draw the press. The irony is that Celtic’s first goal comes from good Rangers pressing. Unfortunately, there are so many individual defensive errors after a spell of good pressure that Celtic end up scoring from a corner. This has to be infuriating for any manager – your system is basically working, but the players within it are constantly letting you down. Rogic’s strike was timed at 49:35, but it’s traceable right back to the second half kicking off. In that four-and-a-half minute segment of the game, all of the main points covered in this article are at play in one brief, but pivotal period of the match. Watch from kick-off up until the goal, read the following, then watch again to see if you agree with the points I’ve made. From the kick-off, Rangers’ higher press is immediately clear. A couple of quick turnovers later and Peña has lost the ball to Rogic. A slip from Tavernier lets Sinclair in to set up Griffiths for the shot, which is blocked. From the resultant corner, talk about fair warning for Rangers – they make a complete hash of clearing the ball first time. However, when they do finally emerge with the ball Peña releases Candeias into a dangerous counter-attacking position. Here we see the poor decision-making from Rangers as Candeias goes down a channel where he has two defenders to face, instead of going the other direction where it could be 2 v 1 in Rangers’ favour. Huge credit to Leigh Griffiths though for working back and making an excellent tackle. Take Griffifths out of that scenario and you are left with a 4 v 4 attacking situation for Rangers, and a high xG chain value. The Griffiths tackle allows Tierney to play it back to Craig Gordon and Celtic can regroup and build again. Rangers’ high press is once again in evidence, although this time Candeias fouls Tierney. Now we are getting closer to the passage of play from where the goal comes. Tierney’s free kick on halfway is played back to Simunovic. Twenty-six passes between the Celtic defence follow, with the ball being played back to Craig Gordon three times during that spell. That was due to the effective Rangers high press. Remember in the first half, there were maybe five, or eight passes between Celtic defenders before the transition was sprung? Here, Celtic have possession for a long time and make a lot of passes, but it’s in an area where Rangers would be happy to allow them possession all day. But, here come the Rangers mistakes. Gordon is forced into a hopeful ball in Kieran Tierney’s direction. Tierney can only help it on with his head. But James Tavernier has rushed at Tierney for some reason and found himself underneath the ball and out of position. Armstrong plays a good ball out to Sinclair who slips. This should now be safe Rangers possession, but Tavernier’s poor control puts him under pressure. He still has a chance to clear but gives the ball straight back to Armstrong. It takes three powder-puff challenges to stop Sinclair, and Celtic had another corner. From there, it’s groundhog day with Rangers’ feeble attempts at clearing the ball. They got away with it minutes earlier. This time they were punished. When Kenny Miller replaced Peña after 53 minutes, Rangers’ high press became even more effective. Almost immediately after the change, this was evident as Celtic were again being forced long. It was now Rangers’ turn to play around a high Celtic press. Rangers’ success was again coming from wide areas. This time Hodson sent Windass away and Rangers won a rare corner. It was from here that Rangers had their best chance of the match. Some scrappy play in Celtic’s box allowed Rangers to recycle possession, and this time they found width on the right. With Candeias still wide on the left having taken the corner, Rangers had managed to stretch Celtic across the width of the pitch. Cardoso played the ball inside Rogic and Tavernier dug out a great cross. Miller’s knockdown gave Morelos a chance. He possibly could have done better, but Craig Gordon narrowed the angle very quickly and made himself big to deny the Columbian. Rangers had another half chance with a Tavernier header shortly after, and again it came from Candeias keeping width on the right. He was found with a good diagonal from Hodson and knocked the ball down for Dorrans to cross. Unfortunately for Rangers, once again they were caught out after a decent spell of play. Celtic’s killer second came directly from the goal kick. Again it was nothing special to begin with. Gordon launched the ball up to halfway and Lustig out-jumped Ryan Jack. Windass was slow to react to the second ball and Celtic substitute Callum McGregor was able to collect, and find Patrick Roberts. From this point on, the goal was pretty special. Roberts drifts in off the right touchline and picks a superb pass to Griffiths, who doesn’t have to break stride to fire the ball into the net with his supposedly weaker foot. There were defensive mistakes from Rangers; Hodson and Windass both had the opportunity to stop Roberts in his tracks. Cardoso didn’t track Griffiths’ run, allowing him to run on the blind side of Ross McCrorie. Finally, Foderingham will be disappointed that the ball went through him. But it was a trademark pass from Roberts; one that very few people in the Scottish Premiership would even see, never mind have the ability to execute. The replay from the reverse angle shows Griffiths’ clever movement even better. You can see the Celtic striker’s starting point is a yard or two behind Cardoso. Griffiths is way ahead of even Roberts at this point, and his fantastic run in behind McCrorie makes Roberts’ mind up. He still had to spot the run and play a perfectly weighted pass through, so top marks to him for that. Griffiths’ finish comes from the width of the six-yard-box, but Cardoso had continued running straight back towards the penalty spot. Brilliant from the Celtic pair – poor from a number of Rangers players. That was that. Having established a two-goal lead, Celtic were able to cruise to the full-time whistle and conserve energy for their midweek trip to Brussels. In all honesty, they were cruising long before that. It was two nil going on five nil for Celtic, really. But, that’s not to say there weren’t positive signs for Rangers. Celtic’s patient defensive passing in order to draw the Rangers press and spring into the attacking transition was picked up by the Rangers bench and steps were taken. Rangers were guilty of choosing the wrong option too many times in potentially dangerous situations, especially on the counter-attack. This is coachable. If Celtic do have an Achilles’ heel it is in wide areas as they revert to a three-man defence when Tierney regularly bombs forward. In Candeias and Tavernier especially, on Tierney’s side, Rangers did have some joy. But Pedro Caixinha has a conundrum on how to deal with Celtic. Does he go for the high press, or the medium block? Rangers did both with varying degrees of success. From a tactical point of view, Rangers weren’t too far off it on Saturday. The big problem is that Celtic have Rangers beaten in the tunnel at the moment. The Bhoys’ dominance and superiority is such that Rangers players were visibly lacking confidence at times and as a result were making far too many individual errors. If – and it’s a big if – Caixinha can coach some of these things into his players, while at the same time instilling some confidence in them, we could have a much closer contest next time.